After using the products for three consecutive days now, I feel like I am starting to see a difference in my skin. I have had a few new pimples surface, but I think that would have happened either way. My skin is also adjusting, so I feel like that is to be expected. So far, my favorite products are: TLC Framboos, B-Hydra, and LaLa Retro. From using the TLC Framboos, I have noticed a reduction in my pore size and a more balanced and bright complexion. It has also helped heal the new pimples that have surfaced more quickly than my normal acne medication from the dermatologist. The redness and size of the pimples have been reduced overnight. B-Hydra has a great gel-like consistency that makes your face feel like it's been refreshed with a cool glass of water. It's incredibly hydrating, but light weight at the same time. LaLa Retro has a thicker, whipped consistency, but nourishes any dry skin immediately. The dry patch that I had on my upper lip for almost a week now has healed up in 2 days from applying both the B-Hyrda and LaLa Retro both day and night. The product that I'm not completely blown away with is the Jelly Cleanser. It just feels like a basic cleanser to me and I could probably get a cheaper one that has the same results. Dab Shaba eye cream—I haven't decided if it would be something that I would invest in the full-size version or not. I'm not someone that struggles with dark circles under my eyes, but it could be good for preventative measures ... still undecided there. The Littles kit does not include all of the Drunk Elephant product line. I would like to go to Sephora this weekend to get a sample of the C-Tango and purchase the TLC Sukari Babyfacialand the JuJu Bar. The Babyfacial literally has a cult following. It is supposed to be the closest thing you can get to a professional facial at home. Michaela Podolsky, a beauty influencer, who has $32,000 in beauty products, said she would give up all of her face masks (over $9,000 of her beauty products were facial masks) and just use the Babyfacial. Babyfacial claims to "dramatically smooth texture, minimize the look of fine lines and wrinkles, unclog pores, and boost overall clarity—revealing fresh, radiant, baby-soft skin." I'm ok with diving all in and purchasing this one because of all of the amazing reviews and results I've seen from using this product. The JuJu Bar is a "unique formulation of thermal mud and bamboo powder creates a wonderful creamy lather that dissolves unwanted oil, rinsing away pore-clogging surface debris and any impurities. It refines skin texture, brightens skin clarity, and over time, helps minimizes the look of pores." I think this will be a more effective cleanser for my skin type than the Jelly Cleanser. My pores do get clogged very easily so I think the mud and bamboo powder in this product will help my skin improve more quickly. I did end up going to Sephora over the weekend to purchase the Babyfacial. My Sephora did not have a full size JuJu bar, but they did have a "baby set" of both the Pekee Bar + JuJu Bar. I decided to buy it since I could then try both the bars, and I really love both of the bars! The Pekee Bar is a gentle cleansing bar that moisturizes, clarifies, and balances the complexion. It has a nice, creamy lather that just feels so silky smooth on the skin. I'm really loving both of them and will continue to be using them primarily as my cleansers moving forward in this trial. I also got samples of the Protini Polypeptide Cream and the C-Tango Multivitamin Eye Cream. The Protini Cream is a thicker moisturizer (similar consistency to the LaLa) that is packed with protein and nutrients for your skin to help replenish and keep your skin strong. It is basically like a protein shake for your face. The C-Tango Eye Cream is designed to replenish and restore radiance around the eyes. Saturday night, I washed my face with the Baby Pekee bar and then applied the Babyfacial to my skin for 20 minutes. The baby facial felt kind of tacky on the skin and tingled a little bit. When I washed it off my skin, my face felt so soft and looked very bright and fresh. I applied the Protini Cream and C-Tango Eye Cream afterwards and went to bed. I honestly felt like I had just gone to the spa to have a facial! 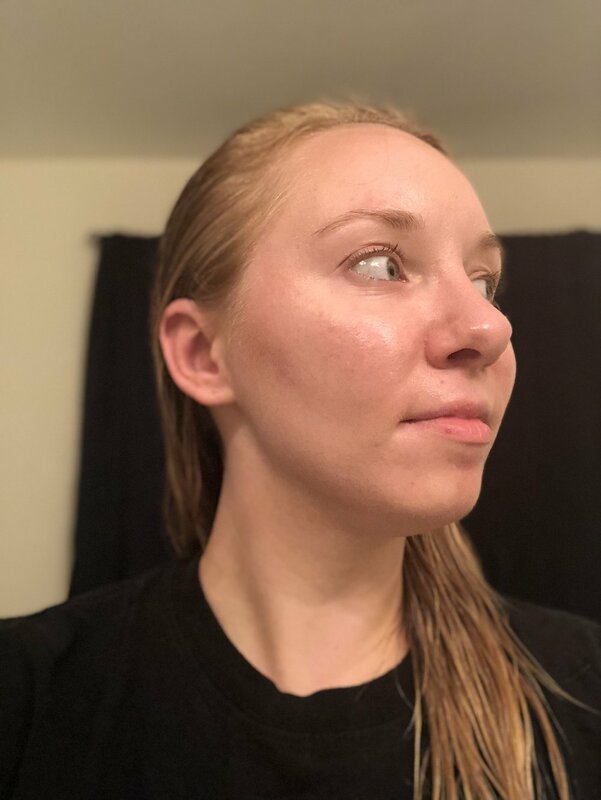 After one week of using the Drunk Elephant products, I've noticed some improvements in my skin! Despite a couple new pimples (this is to be expected when completely changing your skincare routine), my pores are appearing smaller. The couple of the dry, red patches are almost, if not completely, cleared up. I feel like my skin has a more even tone and even "glows" a little bit. I do still have texture on my skin from battling acne for over 15 years, so I'm interested in seeing how that improves over the next couple weeks. I think adding the Babyfacial twice a week will really help with the texture. These four are by far my favorite products in the DE line so far. At night, I mix the T.L.C. Framboos with a little of the Marula oil. In the morning, I make a "cocktail" of the C-Firma and B-Hydra. On Sunday night, I looked in the mirror and I noticed how drastically smaller the pores on my nose and cheeks were. I honestly couldn't believe my eyes! I don't think my pores have been that small since I was twelve years old (not an exaggeration). This past week, I did get one pimple on my left cheek and my chin breakout is continuing to fade. Overall, I noticed more clarity and balance to my skin tone. This whole experiment has been a total game changer for me. It hasn't just been a transformation physically on my face, but also an internal one. I've become a lot more confident in my appearance. I haven't had to touch up my make-up and I'm wearing significantly less make-up. It feels like an answer to prayer. A prayer that I've been praying for for fifteen years. Side Note: Sorry I look like a wet rat in all of these pictures. 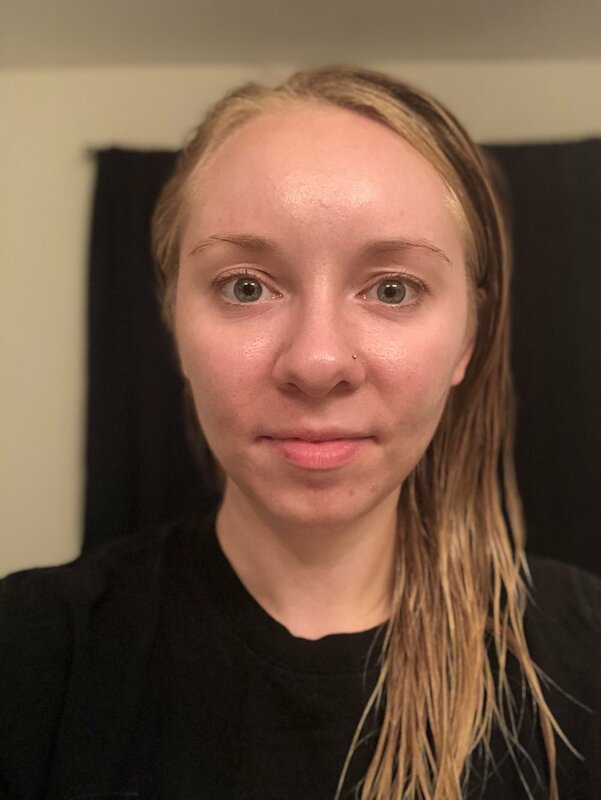 I've been taking my update pictures after I shower at night.